Update: Now in Coconut flavor, too, and available in both single-serve and 24-ounce multi-serve packages. I’ve taste-tested quite a few dairy-free yogurts, I’d even venture to say that I’ve trialed most, if not all, that the market has to offer. 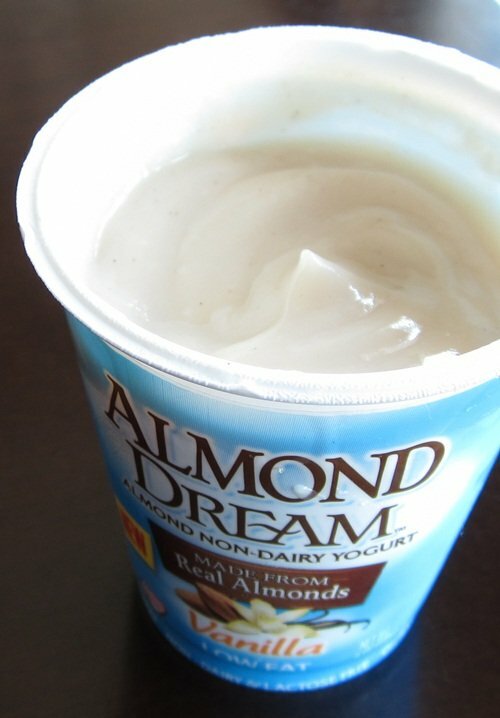 Many are good, but I can honestly say that Almond Dream Almond Non-Dairy Yogurt is quite delicious. Back in the “dairy days” I dutiful downed the most popular brand of yogurt in the name of calcium consumption. I didn’t love it, and in fact have shied away from non-dairy yogurts aside from reviews and the occasional recipe. But, all that changed, as I found myself at the local co-op requesting a stock-up of Vanilla Almond Dream. 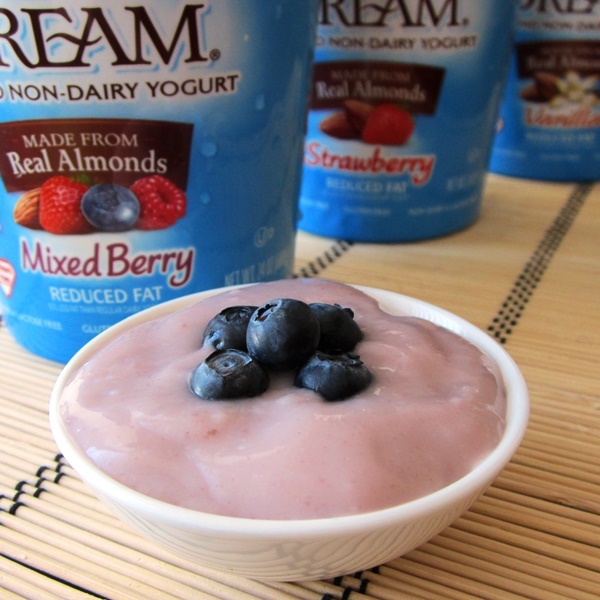 What makes Almond Dream Yogurt so special? In my opinion, it is the perfectly creamy texture, the lightly sweetened flavors, and the very fresh taste with subtle hints of almond. I also love that it is soy-free, gluten-free, and of course dairy-free (yes, it is vegan too! ), and that it has 8 different strains of tummy-taming probiotics! As for the flavors, Almond Dream Almond Non-Dairy Yogurt comes in five varieties: Plain, Vanilla, Strawberry, Mixed Berry, and Coconut. I received the first three to sample as single serves, and later purchased the Coconut. As you may have guessed, the Vanilla was my favorite, but the Coconut came in at a close second. 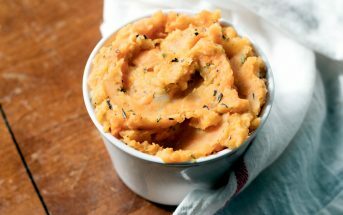 This variety was surprisingly excellent; it is slightly lower in sugars than the others, and has a nice, relatively neutral flavor that should work very well in recipes. It has only a touch of tang, which I think makes it more versatile than traditional yogurt. The Vanilla simply stepped it up a notch flavor. It became my lightly-sweet, post-dinner dessert, topped with pomegranate arils, berries, or even dairy-free chocolate chips. 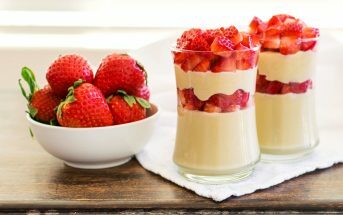 The Strawberry had little chunks of fresh berries within, and shared the sweetness of the Vanilla, but with a bright strawberry flavor. It was delicious as well, but I’m a vanilla girl at heart. The Coconut has the delightful sweetness of the Vanilla but with a notable coconut flavor and random little shreds of unsweetened coconut throughout – a smattering really. I later received the Vanilla (still my favorite), Strawberry and also the Mixed Berry almond non-dairy yogurt in Almond Dream’s new 24-ounce multi-serve packages! The consistency of the quarts was a touch more gelatinous than the creamy single-serves, which I found slightly unappealing, but sweet, delicious and smooth nonetheless. I’m not sure if it was a random batch issue or just different production with the multi-serve, as I later purchased a single-serve and the consistency was more creamy as I remembered. Low Fat – Though made with almonds, each serving contains just 2.5 to 3 grams of fat, and no saturated or trans fats (note that the serving size on the quarts is 1 cup vs a little over 2/3 cup in the single-serve). Calcium – The yogurts are fortified with 20% (200mg) of the RDA for Calcium. Non-GMO – It is made with real almonds and no genetically engineered ingredients. Fiber – They are considered a good source of fiber, with 3 grams per serving. Live & Active Cultures – I mentioned the probiotic benefit above, but thought I would let you know that the probiotic bacterium in Almond Dream Yogurt includes all of the following: L. Acidophilus, P. Lactis, S. Thermophilus, Bifidobacterium Lactis, L. Acidophilus, L. Casei [note that this is a bacteria; it is not associated with the milk protein casein], L. Rhamnosus, L. Delbrueckii Lactis & Bulgaricus. 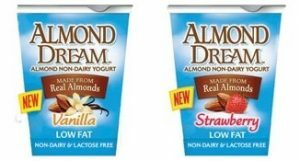 Almond Dream Almond Non-Dairy Yogurt is popping up on store shelves throughout the U.S., and you should even be able to find it at many conventional grocers as the distribution increases. If you don’t see it yet, you can ask the store to bring some in. Certifications: Almond Dream Almond Non-Dairy Yogurt is Certified Kosher Dairy (it doesn’t contain dairy ingredients, but must be made on equipment that processes dairy). It is labeled as gluten-free, but we didn’t note a certification. Dietary Notes: By ingredients, Almond Dream Almond Non-Dairy Yogurt is dairy-free / non-dairy, egg-free, gluten-free, peanut-free, soy-free, vegan, and vegetarian. Nonetheless, check with the company on their manufacturing processes for all varieties if potential allergen cross-contamination is an issue for you. Processes and labeling are subject to change at any time for any company / product. For More Product Information: Visit the Dream Brand website at www.tastethedream.com. They occasionally have printable coupons for their brands on their website too. This sweet, dessert-like yogurt has a smooth, thick consistency that mimics dairy yogurt nicely, but without the strong telltale tang. 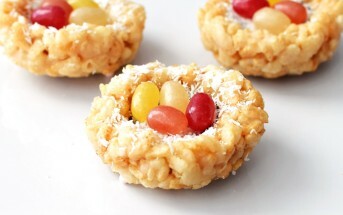 Vanilla is my favorite, but the Coconut was also delightful, and the Plain offers more versatility. My husband liked the very sweet Berry flavors. We knocked it down a star as there seems to be some inconsistency in texture. Sometimes the yogurt was perfectly creamy, while other times it was too gelatinous. Tried this yogurt in attempt to find a good dairy-free yogurt in my new city. Couldn’t even finish the cup and I hated the taste. It was very sweet and tasted processed to me. 15g of sugar in that little container? Definitely will not make the mistake of buying this one again. Yes, I found it very sweet, too, more of a dessert than a breakfast yogurt. Thanks for sharing your feedback Katie! Check their website! I’m sure they have a store locator. I am not really that concerned with protein and sugar content, however, I have developed a highly adverse reaction to dairy and I am trying new types of my favorite foods. Besides the sweetness factor that you mentioned in your review, how close is the taste to normal yogurt? Thank you for the site and the great reviews! Thanks for backing me up Denise! It’s always good to get a second opinion on my end, too! Hi Barbara, you’ll need to contact the company directly – this is a third party review. We aren’t affiliated with the company and wouldn’t know the full scope of their distribution. I have been looking for such dairy free yogurt options. Thanks. what is the sugar content of the plain one? I LOVE the coconut yogurt. It’s so yummy! But I find that it upsets my stomach every time I eat it. Does anyone have the same problem? Their is hardly any protein in almond yogurt 1 percent! It’s ironic since almond is high in protein. I thought they originally had 6 grams of protein but now it says1. It’s like watered down high carb. No thanks they is another brand so delicious and it’s almond Greek yogurt high in protein. I am very disappointed to change I was eating 14 a week. I love this stuff!!!! Just tried the coconut for the first time today and boy oh boy it’s yummy!!! I can’t wait to try them all! I am lactose intolerant and have been looking for yogurt that is lactose free…Where can I find these products… And are they in any grocery store!!! Ghenya, they are in my local grocery store. Head to the company’s website (link in my review above) for a store locator! Pat, it can be, and is tasty, though I do find most dairy-free yogurts are a little icier when frozen. Is there caffeine in this yogurt? as I was told there was caffeine in yogurt. Not sure if it is all yogurt. No, I don’t believe there would ever be caffeine in yogurt unless it was coffee flavor! It all depends on the ingredients. what would you say about the evaporated cane syrup being in the yogurt?? i heard many bad things about this type of sweetener..so does that sugar turn into fat in the body and shooting your blood sugar sky high?? See their website for nutritional information. There are links to their site in my review post above. Alisa, being that I thought the So Delicious Greek Almond Milk yogurt was nasty, should I even try this one or are they similar in taste and consistency?? Hi Amber, it has been a while since I’ve tried this one, but I do know that they are a bit different. 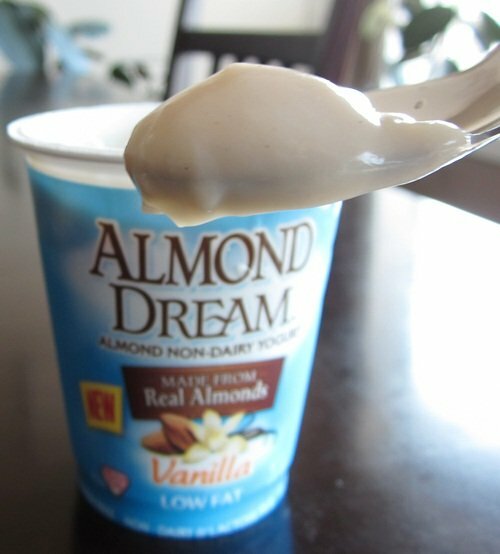 The So Delicious variation is lower in sugar, so the flavor on Almond Dream is more developed and sweeter. Also, Almond Dream is more of an “ordinary” yogurt in texture. The So Delicious variety is thicker (with pea protein added) since they are going for more of a “greek” yogurt. I just prefer the lower sugar one myself as I usually add things like cereal, fruit, etc. The label says non-dairy, not dairy free. I learned the hard way that dairy free products can still have milk derivatives in it. The ingredients list doesn’t show dairy, but I worry. The label says soy-free and gluten free, but not dairy free (non dairy). I wonder if is truly vegan and dairy free? Amy, this is a dairy-free product. Dairy has to be listed in the ingredients. If you are concerned about trace amounts of dairy (due to manufacturing processes) then that is a different story. You need to contact the manufacturer directly on processes if trace amounts are a concern. Do you think some of the probiotics are derived from milk? A lot usually are. That is the only thing that jumped out at me. Hi Becky, at our time of review, they were not, but I’d check with the manufacturer if this is a concern. The dairy-free yogurt manufacturers tend to have better access to probiotics grown on dairy-free mediums than the average consumer. zip code 34990. where can i buy your product? Bobbi, we aren’t affiliated with the company – this is a review. See the links in the article to go directly to the company website! Hi Roberta, you will need to go to the company website and use the store locator or contact the company directly for this info. There are links to their website in the review. Good luck!